Versatility, performance and luxury go hand in hand when you choose a luxury crossover and the award-winning 2018 Jaguar F-PACE delivers on all counts. Are you looking for a luxury crossover that checks all the boxes for the family on the go? 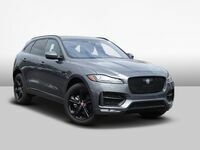 With a dynamic style, a wealth of innovative technology, powerful engine options and much more, the Jaguar F-PACE is a fan favorite at Barrett Jaguar. Take a closer look at how the Jaguar F-PACE compares to an industry favorite in this 2018 Jaguar F-PACE vs 2018 Mercedes-Benz GLC comparison. When you opt for the 2018 Jaguar F-PACE, you will have a choice of six trim levels – F-PACE, Premium, Prestige, R-Sport, S and Portfolio – that can be equipped with four fun-to-drive engine options. With room for five passengers in a luxury-infused cabin that plays host to a standard eight-inch InControl® Touch™ touchscreen display with access to Apple CarPlay and Android Auto, the Jaguar F-PACE will keep you connected. Additional standard features include 18-inch wheels, a power liftgate, a panoramic sunroof, luxurious LuxTec interior, a 380-watt Meridian™ sound system and much more. What Are the Differences Between the Jaguar F-PACE and Mercedes-Benz GLC? Explore the luxury compact crossover segment and you will find few models with a more impressive resume than the award-winning Jaguar F-PACE. A relative newcomer to the class, the Jaguar F-PACE will go toe to toe with industry mainstays and deliver an elite performance. 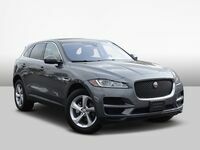 When you explore this 2018 Jaguar F-PACE vs 2018 Mercedes-Benz GLC comparison, you will find that the Jaguar F-PACE with an affordable starting price of $42,065 promises more bang for your buck with a more capable design and a wealth of engine options that the Mercedes-Benz crossover cannot match. 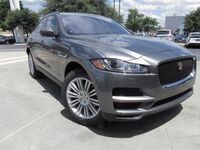 At the heart of the Jaguar F-PACE design, you will find a standard 247-horsepower 2.0-liter turbocharged four-cylinder engine that is married to an eight-speed automatic transmission. With standard all-wheel drive that incorporates Intelligent Driveline Dynamics, the Jaguar F-PACE will make 22 mpg in the city and 27 mpg on the highway. Mercedes-Benz GLC models play host to a 241-horsepower 2.0-liter turbocharged four-cylinder and a nine-speed automatic gearbox that delivers similar fuel-economy numbers with rear-wheel drive. Mercedes-Benz 4MATIC all-wheel drive is available with a price tag that stands at $42,050. Additional powertrains for the Jaguar F-PACE include a 180-horsepower 2.0-liter turbodiesel that will make 33 mpg on the highway, a refined 296-horsepower 2.0-liter turbocharged four-cylinder and a thrilling 380-horsepower 3.0-liter supercharged V-6 power core. Mercedes-Benz GLC models counter with Mercedes-AMG powertrains that include a humdrum 3.0-liter turbocharged V-6 engine and a costly 4.0-liter turbocharged V-8. When it comes to versatility and utility, the Mercedes-Benz crossover falls short of expectations and cannot match the 2018 Jaguar F-PACE. Jaguar F-PACE models possess an impressive, family-friendly 33.5 cubic feet of cargo space behind the second row. In addition to a spacious interior, the Jaguar F-PACE will tow 5,290 pounds of cargo – more than most competitors. The Mercedes-Benz GLC features just 17.6 cubic feet of cargo space behind rear seats and will tow a lackluster 3,500 pounds.